This article is from the Fall 1999 AFRMA Rat & Mouse Tales news-magazine. QHow do you domesticate and get the fleas and ticks off wild mice? AIt is very hard to domesticate wild mice. You would have to start with tiny babies that have not even opened their eyes yet and raise them to adults. Even then they are jumpy and prone to biting. An adult mouse taken from the wild will never be tame. 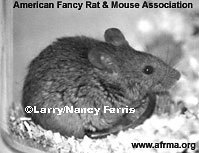 Domestic mice have been raised for over 150 years and only the nicest and calmest were bred. That is why they are for the most part friendly and make good pets. It would take many years to start over with wild mice and make them domesticated enough for good pets. I found some pinkie wild mice when cleaning the shed one day. I fostered the 5 little babies to a domestic mouse I had that only had 2 young kittens of her own. Three of the wild babies died. It is possible that the milk of the wild and domestic mice was different and that the orphan mice just didn’t get enough nutrients to stay healthy or they were weak and didn’t have the strength to nurse properly. The two that did survive never got tame no matter how much I handled them. Finally, I donated them to the local museum for their wild animal display where they are still living today. As for the removal of parasites, the best way is have your veterinarian put ivermectin on their back so they can lick it off. This will kill the parasites. Cat flea powder also works, but you have to be careful not to get any in their eyes. No treatment should be used on nursing mothers or young babies.